How cute is this? Doesn't hurt that the pattern is called Isobel. 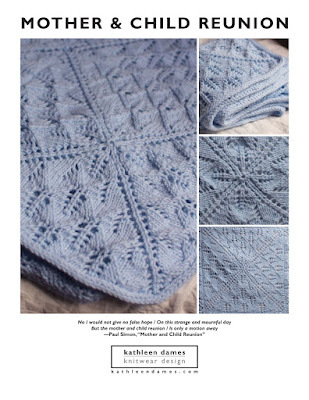 I just read about French Girl patterns on the Knitlist. I just wish they had more information about the patterns on their site (sizes, how much yarn, needles, etc.). They do list the yarn used, but I think knowing how much yarn a project is going to require helps in making a decision. Ah, Jimmy Beans Wool includes some pattern information but doesn't have as many patterns for sale. Looks like the patterns are Rowan-centric, yarn-wise, though, again, Jimmy Beans Wool shows some alternative yarn options when Rowan has discontinued the yarn for the pattern. In other news I dropped another two stitches on Clapotis. In the straight section I could manage one repeat a night, and yesterday I did one decrease repeat. I hope to increase the number of rows as we decrease the stitches on the needles because I want to finish this! There are so many other things to knit. For that future project with the Boucle, I want to call it En Garde and tie it closed with a big, red, silky ribbon. What do you think? I want it be quite shaped in the body, too. It's starting to take shape!